First Line: Shivers race through my veins like gilded fireworks. Review: So I had this books marked off as a Mermaid book but Surprise! It had nothing to do with mermaids more like aliens who came to our planet a long time ago because there planet was destroyed. The book was actually about a new species called Aquarathi and you can tell the author took her time with the creativeness behind it. Nerissa is to claim her throne as the Queen from the Undersea Kingdom which she comes from but there are a few who will go to any lengths to stop her from doing so. It took some time for me to like Nerissa she just came off as snooty and selfish and it took her awhile to start changing and growing as a character to where I grew to like her. I found Waterfell to be highly fast paced with lots of secrets being revealed and quite a few twists and turns. The only thing that was a little predictable for me was Lo and who he was, I started getting suspicious of him early on and had guessed exactly who he was before the big reveal of his character. My favorite character out the entire book was actually Nerissa's best friend Jenna she was just an amazing best friend who wasn't afraid to tell Nerissa when she was acting like a jerk or any of that. And then she had no issues keeping Nerissa's secret or even coming to her rescue when fighting off some hybrid. 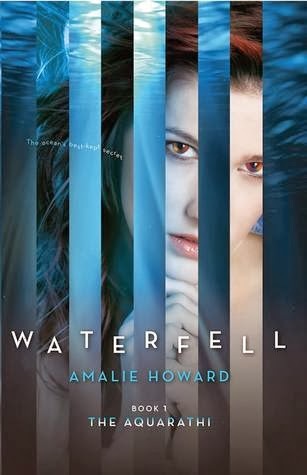 Overall I liked Waterfell for it's originality and the plot itself I found to be fast paced and intriguing enough to keep me turning the pages. ~ "My best friend is an alien. It sounds like some B-movie title."